Welcome to the Newhall neighborhood. We're happy to have you here. If you're a Newhall neighbor or an interested friend, consider connecting with us on Facebook, Twitter, or via email to get the latest updates about neighborhood happenings. Just click the links above! 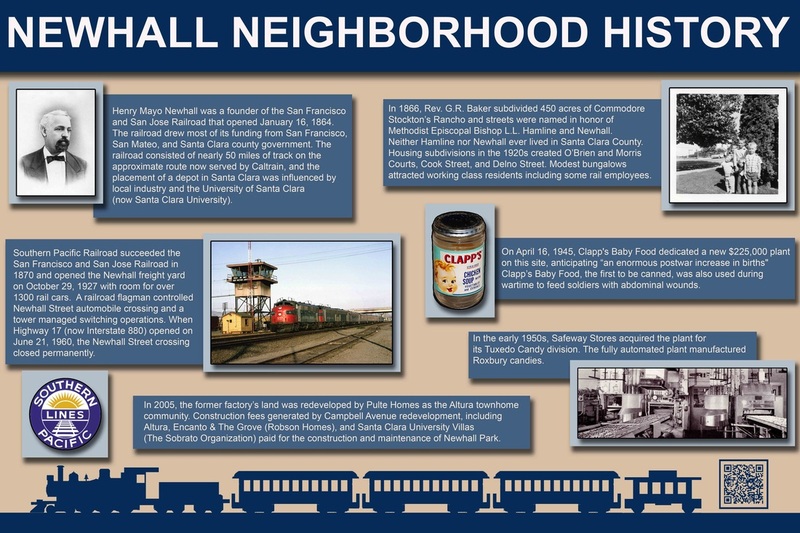 Now, a little bit about the plaque in front of you: throughout 2012, neighborhood historians combined with the City of San Jose, History San Jose, and dozens of interested neighbors to develop the first monument in our Newhall neighborhood history initiative. There are many more stories to tell, from the boxing arena and distillery that once stood down Newhall St (on the site of the Best Western motel), to the college students who once took a dip in Cook's Pond, and all the way back to the arrest of a corrupt, high-rolling sheriff just around the corner. If you are a history buff, a history student, know a future Eagle Scout looking for a project, or have a general love of learning, email info@newhallna.org to get involved! We need people like YOU to make this project a success, and you can invest as much or as little time as you can afford to spend. Thanks and enjoy!